To say that Realty Income (NYSE: O) takes its dividend seriously would be like saying Mick Jagger is a great rock ‘n’ roll frontman. In other words, it’s an understatement. Realty Income promotes itself as “The Monthly Dividend Company,” so clearly the dividend is important to it. And management puts the company’s money where its mouth is. Realty Income has paid a monthly dividend for more than 47 years. Perhaps more impressive is that the dividend has increased every quarter for the past 82 quarters. A 20-plus year track record of quarterly dividend raises is amazing as long as the dividend is safe. Realty Income has more than 5,300 properties in 49 states and Puerto Rico. Its largest tenants are Walgreens Boots Alliance (Nasdaq: WBA), FedEx (NYSE: FDX) and Dollar General (NYSE: DG). In 2014, Realty Income generated $563 million in FFO. Last year, that figure was $773 million. In 2018, it’s expected to jump 16% to $899 million. In 2017, Realty Income paid shareholders $689 million in dividends, or 89% of its FFO. This year, Wall Street predicts the company will pay shareholders $748 million in dividends, or 83% of FFO. So the company still has plenty of ammo to continue to raise the dividend every quarter. 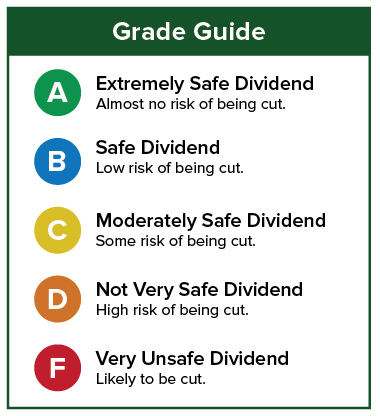 The current dividend is $0.2195 per month or $2.634 per year, which comes out to a 5% yield. Though with that 20-year history of quarterly boosts, we’ll likely see another raise in the next month or two. 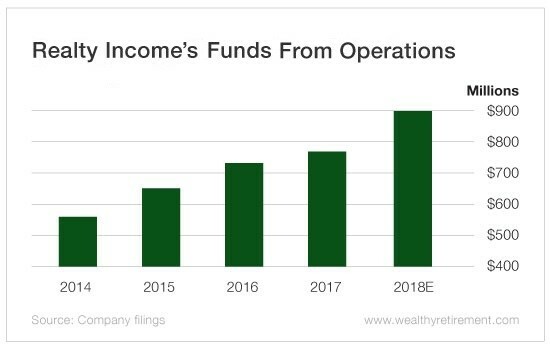 Realty Income has an extremely strong track record when it comes to paying and raising its dividend. With FFO rising and easily covering the dividend, it should have no problem keeping that streak of quarterly dividend hikes alive for the foreseeable future.